"A Game for Two" depicts the King and Queen playing games. Softly surreal. 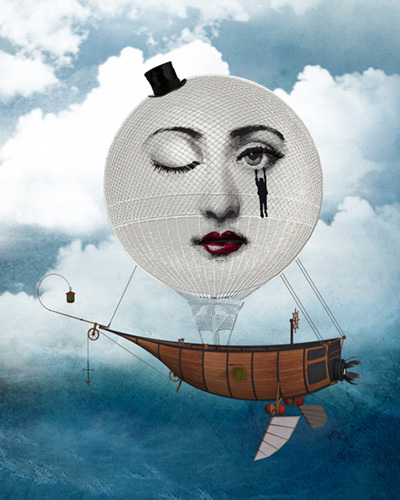 This whimsical digital image depicts a hot air balloon as the face of a woman with a silhouette of a man hanging from the rim of her eye. It features a playful and surreal scene. All limited edition prints on canvas are gallery-wrapped with black or white border and are ready to hang. 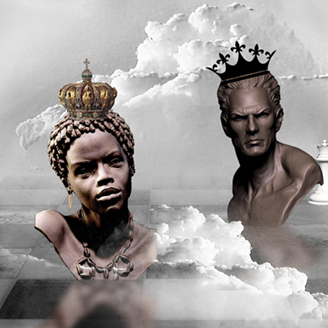 Ann Baker is a self-taught artist who has been creating playful and humorous surreal digital works for the past ten years. 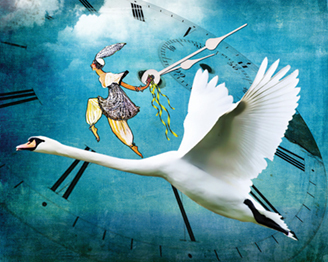 "A Time to Dance" is a surreal dreamlike interpretation of a freedom to dance. 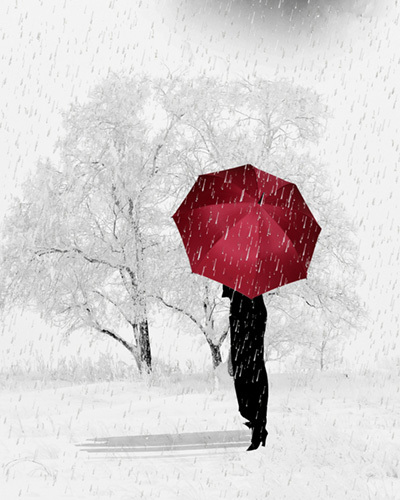 This beautiful contemporary digital image features a silhouette of a woman with a red umbrella set against a stark, white snowy landscape. All limited edition prints on canvas are gallery-wrapped with black or white border and are ready to hang. 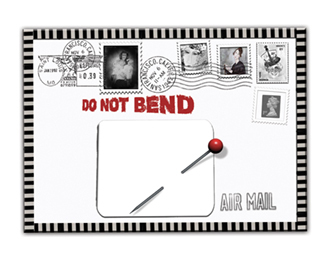 Ann Baker is a self-taught artist who has been creating playful and humorous surreal digital works for the past ten years. 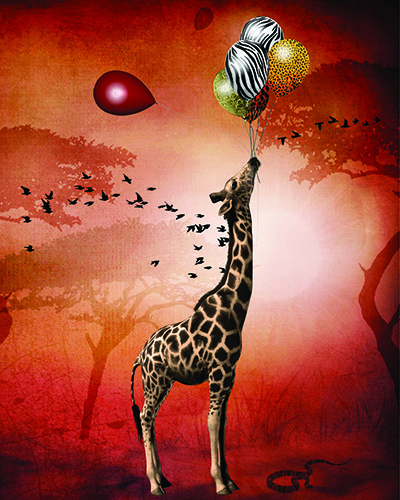 This lyrical and striking digital image features a giraffe with balloons in his mouth, made of animal textures. It’s set in an African, monochromatic red landscape. All limited edition prints on canvas are gallery-wrapped with black or white border and are ready to hang. 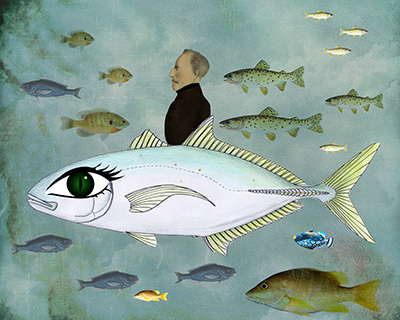 This work depicts a steampunk fish, transporting a man in a surreal scene, and features a primarily green and blue underwater palette. All limited edition prints on canvas are gallery-wrapped with black or white border and are ready to hang. 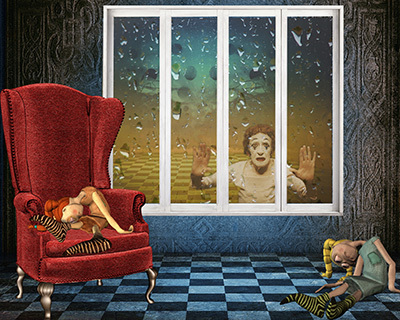 This contemporary surreal scene features a clown looking into the window from the rain to a room with two rag dolls. All limited edition prints on canvas are gallery-wrapped with black or white border and are ready to hang. 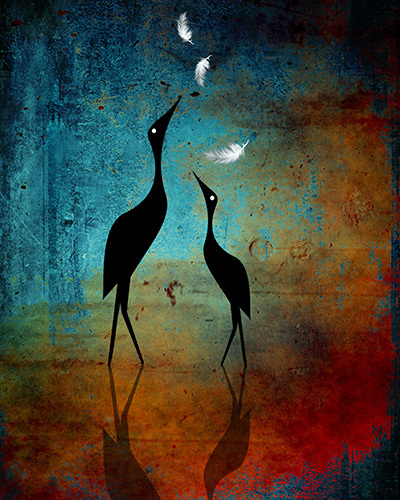 This striking and vibrant digital image depicts a silhouette of two blackbirds set against a background featuring a colorful shades of blue, red and orange. All limited edition prints on canvas are gallery-wrapped with black or white border and are ready to hang. 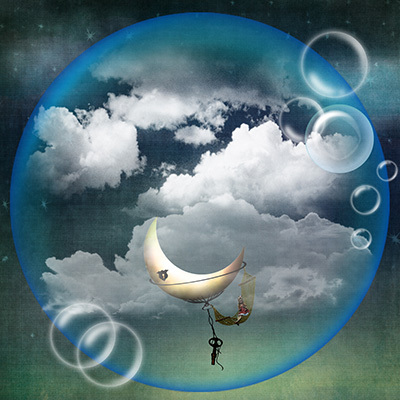 This contemporary surreal scene features a girl in a hammock, hanging on a crescent moon and enclosed in a bubble as the girl travels through the night. All limited edition prints on canvas are gallery-wrapped with black or white border and are ready to hang. 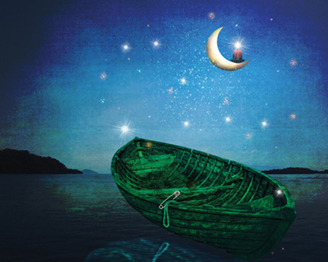 "By the Light of the Moon" is a play on words when the moon is lit by a candle. Tongue in cheek and surreal. "Cheeky" depicts two children cheekily showing their bottoms to world! Photoshop and iPhone apps manipulated image. 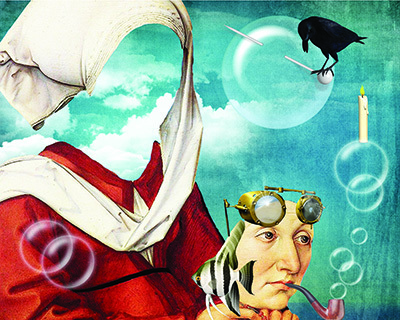 This contemporary surreal scene depicts someone lost in a day dream as bubbles come out of his pipe, and a black raven sits on a pin piercing a bubble. All limited edition prints on canvas are gallery-wrapped with black or white border and are ready to hang. 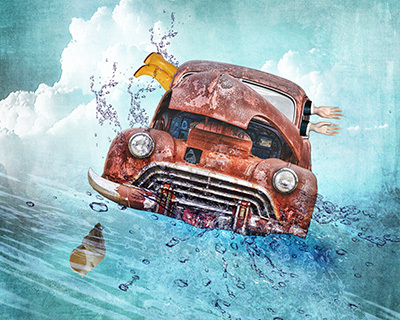 This artwork depicts a surreal scene on the high seas with a person in yellow rain boots, drowning not waving. Although the title suggests it's serious, there's a humorous and the absurd tone which Baker injects into her images. All limited edition prints on canvas are gallery-wrapped with black or white border and are ready to hang. 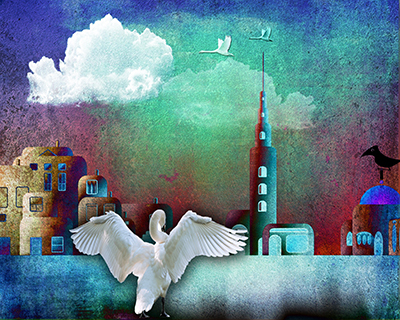 This vibrant digital image depicts an Eastern scene featuring striking white birds in a colorful and exotic cityscape in shades of blue, red, green and magenta. All limited edition prints on canvas are gallery-wrapped with black or white border and are ready to hang. 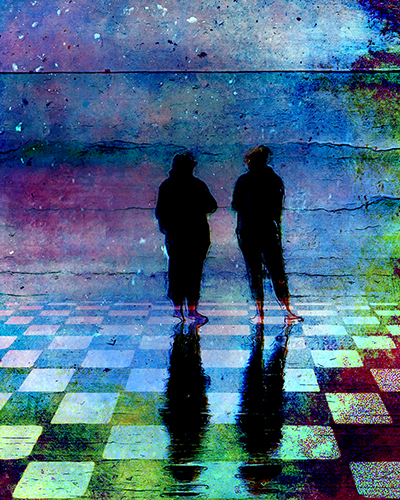 This contempoary digital image depicts two women talking to one another and looking out to sea. Set in a background of ocean and geometric tiles in the foreground. All limited edition prints on canvas are gallery-wrapped with black or white border and are ready to hang. 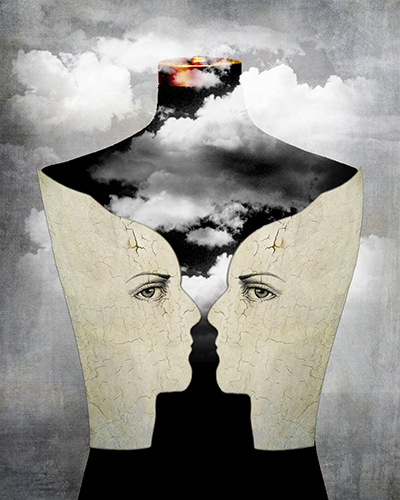 This surreal work is a playful representation of two sides of a face, facing each other. All limited edition prints on canvas are gallery-wrapped with black or white border and are ready to hang. 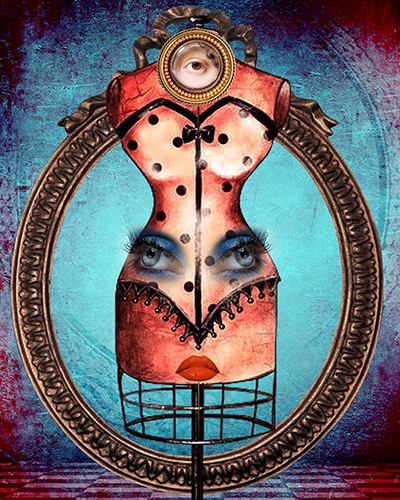 This beautiful digital image is a composite of a mannequin with a corset, with face of a woman on the lower body, and a single eye on the neck area. The palette is in nostagic shades of blue to purple. All limited edition prints on canvas are gallery-wrapped with black or white border and are ready to hang. 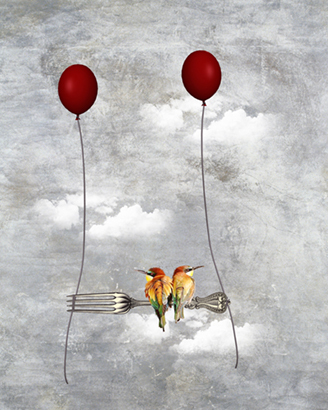 "Floating Away" depicts two little birds floating away on an unlikely perch supported by two red balloons. It’s surreal, dreamlike and tongue in cheek. 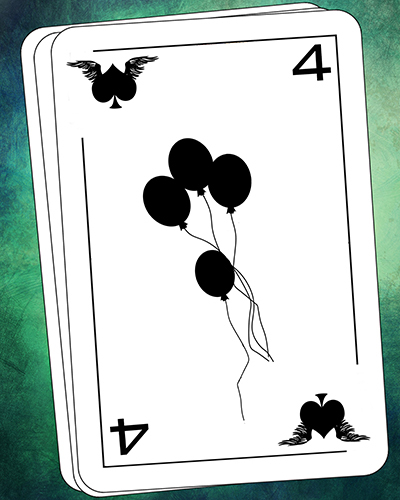 This contemporary image plays with images on deck of cards, replacing the graphics with balloons and hearts in black and white. All limited edition prints on canvas are gallery-wrapped with black or white border and are ready to hang. Ann Baker was born in 1948 in England. She is a self-taught artist who began to create in 2007 when she finished work and entered by second childhood. Her main genre is a type of surreal where her compositions are inhabited by everyday objects arranged in unexpected ways to create something playful, humorous, whimsical or absurd, and where there is little or no meaning and not much sense and where it is left to the viewer to make sense of what he/she sees. If asked, she would say that her style is nothing more than ’Stuff and Nonsense’ as can be found in Nonsense Poetry. Her chosen medium is to create digitally by means of Photoshop using her own photographs and the masses of copyright free images to be found on the web. She is also passionate about iPhoneography and create using her iPhone and the myriad of photo manipulation apps readily available. The artist takes her inspiration from many areas such as the patterns and random harmonies created by the lights, colours and shapes in nature. She is also inspired by contemporary artists such as Maggie Taylor, Liz Huston, Rafal Olbinski and Eduardo Recife. Oh, and of course, the works of Lewis Carroll.